A few weeks ago I showed you Freebs my crazy “smoothie bags” on my Instagram stories…and you freaked a leak about them! I thought they were fairly uninteresting, but boy, was I wrong! My feed, messages, and comments blew up about them. 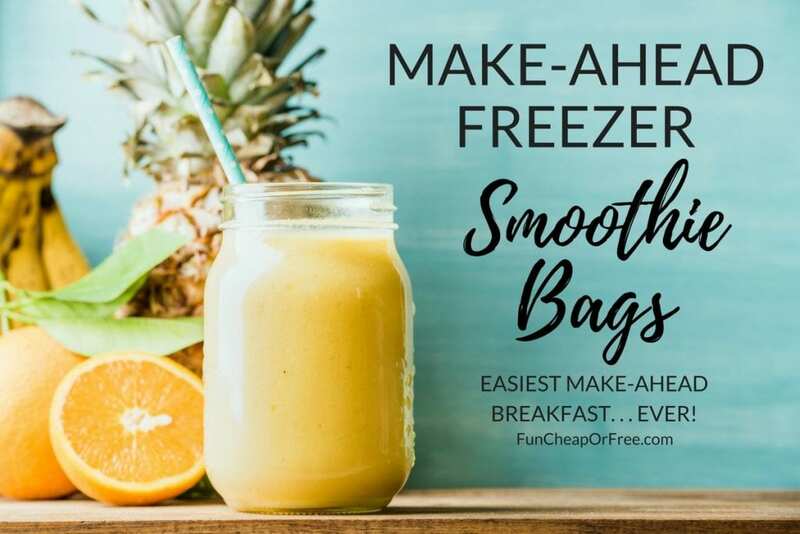 Freezer smoothie bags are such an easy way to get fresh, healthy, substantial smoothies made on a busy morning. Since these glorious little bags are perfect for the #Shelftember challenge we have running all month long, I made a super quick (literally. 2 minutes. you're crazy if you don't watch this…) video showing you how I do them! If you're new here, I upload new videos every Thursday to my YouTube channel. AAAaaaaaannnnd sometimes I pop in an extra video here and there, so be sure to subscribe and turn on your notification doohickey so you don't miss any of the party! See, told you that was quick! Do you do this too? What do you like to put in your smoothies? I’ve done these before but it was so hard to get them out of the baggies when I needed them for smoothies. What is your trick for that? Gracias mi amiga. Hi, Vicki. Not Jordan, but just thinking…Perhaps thaw in fridge before bedtime? Or run some hot water over bag or dunk in a bowl of hot water for a minute? I just cut the bag so I can get everything out and then just throw the bag away. I think a couple of pre-made bags would make a great hostess gift! Good to know about the Emergency-C! I like to throw almond butter or some kind of “peanut” butter in with spinach and fruit and a scoop of protein powder. Don’t know if protein powder has to be added at time of blending? Anyone ever use cottage cheese in smoothies? Oh this makes me so ready for summer 😎☀️ I love that you share all the best recipes that are practical and delicious! This is very smart. Especially since a lot of tropical fruit is on sale right now. ($0.99 pineapples!!). I have never tried freezing spinach in a bag before, I will have to try this! I have only frozen blended up spinach ice cubes. This is genious! 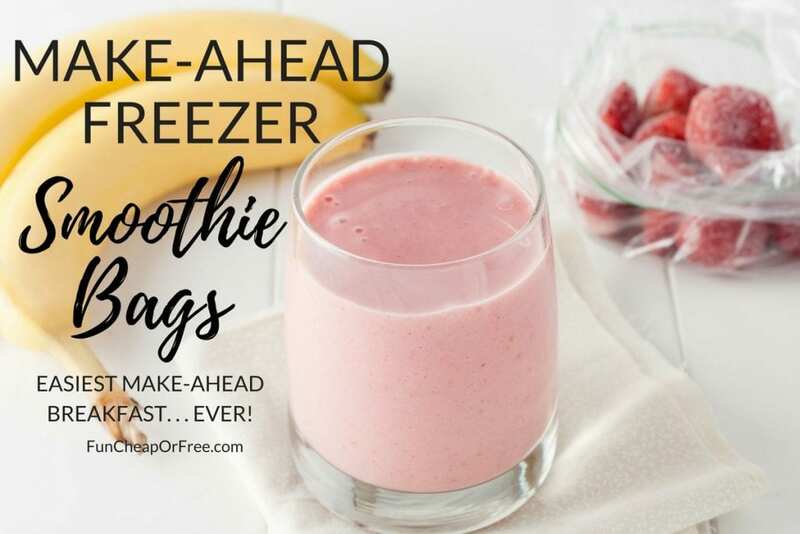 We are obsessed with smoothies in our house and this would save SO MUCH time! I make smoothies every morning and my kids love them but I’ve never used carrots. I’m going to have to try that! Love this idea! Will definetly be using this for busy mornings soon to come! Thank you! Love this idea! Great morning time saver. I have about 5 bags left in my freezer and have made my life so much easier!! I love smoothies and I have wanted to try making these freezer bags forever. Thanks for the tips and motivation! I have never been a big breakfast eater and in turn unfortunately it’s also hit my kids..this really changed the game for us and the fact that I can hide all the healthy foods they hate in it is a secret WIN for me!!!! I made these last week because I thought it was a great idea but I’m not loving it. It all freezes in one huge clump and it won’t fit in my blender and I end up spending more time trying to break it up to fit in my blender than it would take to just make it from scratch each day. Anyone else have this problem? Probably too late, but we freeze peaches in the fall for smoothies all winter and we freeze them in a big clump that also doesn’t come out of the bag or fit in my blender. I just toss it in the microwave for 1 minute and it softens enough for me to break it in half and dump it all in. Good luck! I have the hardest time making mine sweet and yummy enough these days. I’m going to make some of these! Just stocked up on spinach/fruit galore. Totally making these. Such a good idea. Love me a breakfast smoothie! I drink a smoothie daily, love these ideas! I’m going to start adding emergen-c to our smoothies. Great idea! This is a great idea! I love being more productive by planning ahead! Oh this would be perfect for protein shakes! Make the baggies, and use one with a couple of scoops of protein powder… I’ll have to add extra veggies and fruit to my list for next week! This little prep is a big time saver making mornings smoother in our household. Extra points when I have the kids make their own “blend” so they have something to look forward to! Great idea! Gotta sneak in those veggies! This would work well for me. I think you just have to adjust for your family. She has a family of 7 going on 8 and could probably put 4 bananas plus fruit juice in it for sweetness. For me personally I’d use 3/4 cup total of fruit/veggie at a time and no banana because of an allergy. But the concept is a great one. I’d also be the only one in my family of 4 who’d drink it……picky house. Wow! That was so easy and smooth. For a smoothie lover like me, I will definitely try this smoothie bags. It’s so convenient for moms like me who are working remotely. Thanks for sharing this! And by the way, your little girl is so cute and lovely. Aww thank you so much! Yes- smoothie bags are awesome!